Macadam sports facilities are popular in the UK because they’re ideal for a wide range of different activities, many tennis courts are surfaced in this particular hard court specification because of the ball bounce and slip resistance qualities. However over time, the tarmac flooring can become contaminated by dirt and natural matter making it unsafe for use, this is why we offer specialist services for refurbishing mossy tennis court surfaces to restore the original quality. If a tarmac sports court is not cleaned and maintained regularly, the porous system of the macadam surfacing can become clogged up with leaves, mud and other debris which has not been cleared away from the area. This then leads to various drainage issues as rainwater builds up on the surface and can’t drain away through the pores within the macadam and the stone sub base. When this happens, puddles build up on the surface and therefore make the court slippery and unsuitable for use by players. 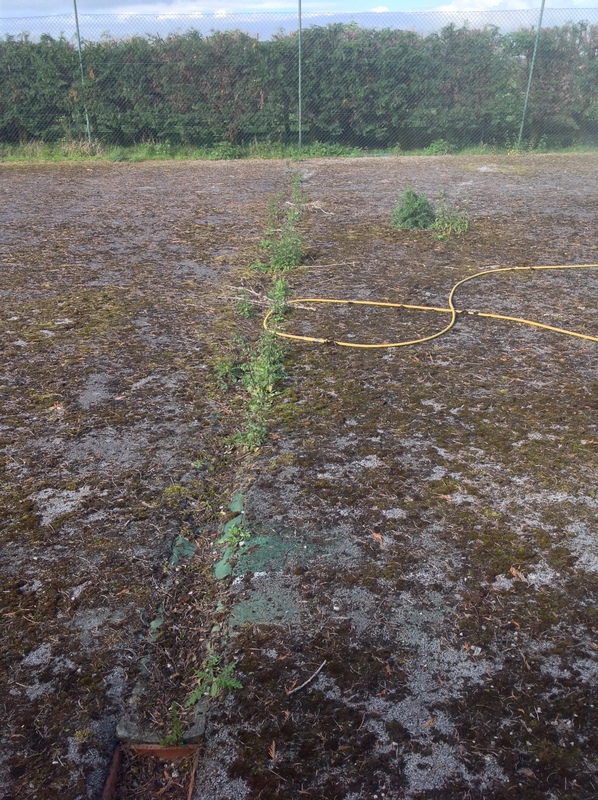 The damp and dirty conditions also promote the growth of contaminants like moss and algae which can cause even more problems of flooding and an unsafe playing surface. 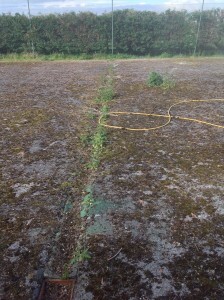 A macadam sports facility in Lancashire was suffering from these problems of moss contamination which meant the surface could not be used. We were contacted in regards to refurbishing mossy tennis court surfacing at this particular facility to help bring back the performance characteristics and make the area a usable sports surface again. We began the process by carrying out a thorough jet wash of the existing area to get rid of the moss and algae contamination which was covering the entire court. This is done with a specialist macadam surface cleaning agent which binds to the dirt on the flooring and lifts it away from the surface. Once the layer of moss and dirt had been blasted away from the sports surface, the original macadam flooring was clean and prepared for a fresh new paint coating. With this project of contaminated sports flooring refurbishment, the client chose to have a new acrylic anti slip coating applied in a green two tone design. The outer runoff area was painted in light green, and the main court playing surface was sprayed with a darker great acrylic coating. This type of slip resistant paint creates greater friction on the court surface as a combination of sand and aluminium oxide is mixed into the paint prior to its application. Finally, clear white tennis line markings were put down onto the freshly painted court surface to create accurate dimensions for tennis matches and training sessions. 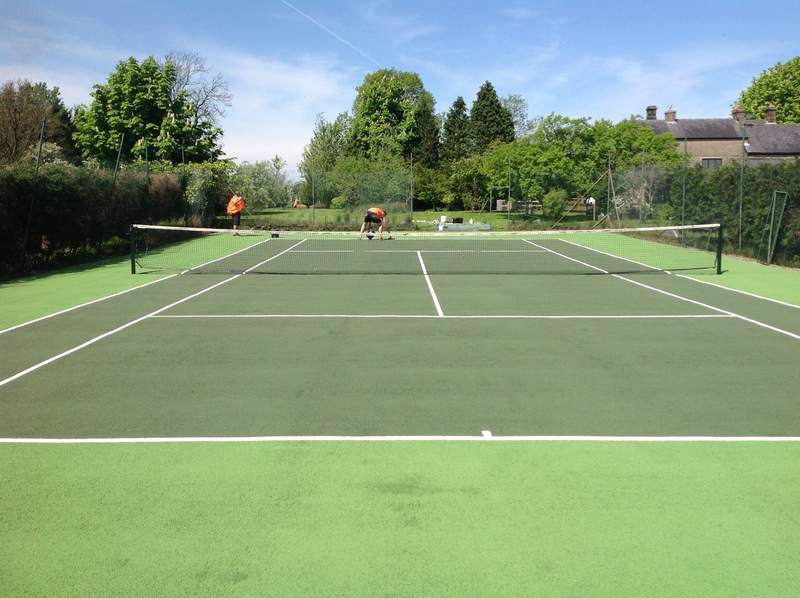 After the sport surfacing refurbishment process has been completed, the client was very happy with their top quality new tennis court which can now be used all year round as the drainage capabilities and playing qualities have been restored. Please feel free to get in touch with us if you have a contaminated mossy tennis court which is in need of maintenance or refurbishment. A member of our experienced team will get back to you with some further product information as well as details of costs for your individual project. You can also visit this page https://www.sportsandsafetysurfaces.co.uk/sports/tennis/maintenance/ to find out more about the maintenance you can do to prevent your tennis court from becoming contaminated.